MidwayUSA has started its Black Friday Week discounts. Go to MidwayUSA’s Daily Specials Page and you’ll find new deals that become available each day of this week. Monday’s Deal Pick: Among the many specials released yesterday was the MidwayUSA 6-Pocket Tactical Rifle Gun Case. Available in 42″ or 46″ sizes, either Black or Olive Drab, this case is now just $18.99, marked down from $34.99. Tuesday Deal Pick: Our selection from the deals released for Tuesday, Nov. 22 is the Pro Series Competition Shooting Mat Olive Drab, MidwayUSA #158660, for just $29.99. This is an awesome price on a good-quality mat. We’ve used this mat and can recommend it. It’s a steal at $29.99 — That price is good for November 22 only! 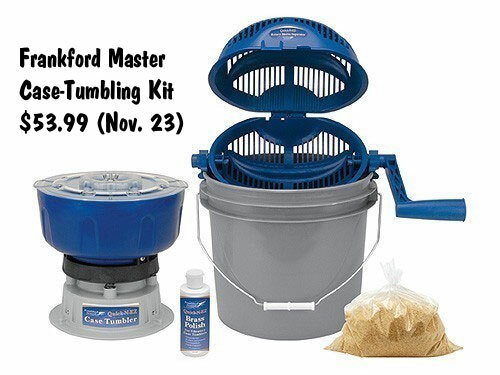 Wednesday Deal Pick: From the items that go on sale Wednesday, our top selection is the Frankford Master Case-Tumbling Kit for just $53.99. This includes Vibratory Tumbler, 3.5 gallon bucket, Rotary Media Separator, liquid polish, and 3 lbs. of tumbling media. The powered tumbler holds 600 9mm cases or 360 .223 Rem cases. The $53.99 price starts at 12:01 am on Wednesday, November 23rd. Thursday Deal Pick: We bet most of you guys have at least one .45 ACP in your gun collection. Well on Thursday, November 24th, you can grab 1000 Ranier 200gr RN copper-plated .45 cal bullets for just $99.00. The lead core in these bullets is completely coated by copper, top and bottom, so you can use these in lead-restricted ranges. To complement your new bullets, why not pick up a 14″ tactical pistol case for just $7.49. These zipper-top pistol bags are nicely-padded and have seven external mag pouches. Colors are black or olive drab. This price starts at 12:01 am on Thursday, November 24th. In addition to the specially-discounted Black Friday items, you can save $15 off an order of $100 or more on normally-priced items. Use Promo Code 11281177 at Check-Out. IMPORTANT: This $15 Off promo code is limited to regular price, in-stock products only. The discount can only be used once and cannot be combined with other promotions. The offer expires at 11:59 p.m. CT on November 28, 2011. Share the post "Hot Day-by-Day Deals This Week at MidwayUSA.com"